NASA's latest lunar probe has wrapped up the explorationphase of its moon-watching mission and is shifting into pure science gear to helpscientists better understand Earth's nearest neighbor. Until now, the powerful LunarReconnaissance Orbiter had been scouting the moon to help NASA plan for futurelunar exploration missions. 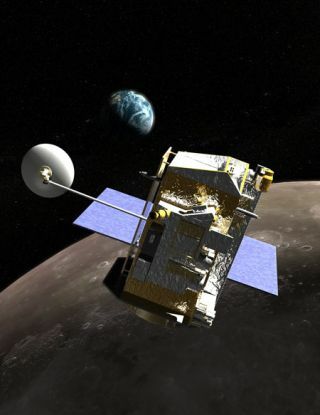 NASA launched the $504 million LRO probe in June 2009 alongwith a piggyback probe that crashed into the shadows of a crater at the moon'ssouth pole in October of that year in a hunt for water ice, which it found. Thespacecraft is about the size of a Mini Cooper car and equipped with seveninstruments to observe the moon. From its polar orbit 31 miles (50 km) up, LRO produced acomprehensive map of the lunar surface in unprecedented detail, NASA officialssaid. The probe has also searched for resources and safelanding sites for potential future missions to the moon, measured lunartemperatures and radiation levels and helped confirm the presence of wateron the moon. LRO's new mission phase will be more focused onanswering specific research questions than on broad exploration, NASA officialssaid. The probe will continue to map the moon for two to four more years, theyadded. "The official start of LRO's science phase should write a new andintriguing chapter in lunar research," said Ed Weiler, associateadministrator for NASA's science mission directorate. LRO was no slouch during its exploration mission. When the spacecraft finishes transmitting all of the moonobservations and data it gathered during the past year, it will have beamedmore information home to NASA databases than all other previous planetarymissions combined, agency officials said. That information has had a profoundimpact on our understanding of the moon, they added. For example, LRO helped confirm the presence of water onthe moon along with other lunar probes from Japan and India. When its piggybackprobe, the LunarCrater Observation and Sensing Satellite ? or LCROSS, smashed into thelunar surface in October 2009, LRO's instruments detected water-ice in theresulting impact plume. LRO has also found that parts of the moon are colderthan Pluto. The probe measured a location in the moon's Hermite Crater at minus415 degrees Fahrenheit (minus 248 degrees Celsius). The surface of Pluto, whichis much farther from the sun's warmth, likely only gets down to about minus 300F (minus 184 C), researchers have said. In addition, LRO made new observations of the Apollolanding sites and gathered detailed information about lunar terrain. The probealso found the first evidence of widespread lunar thrust faults, which indicatethat the moon has recently contracted and may still be shrinking, NASAofficials said. LRO has a robotic moon probe bloodhound. This year, it took high-resolutionpictures of the Soviet Union's old Lunokhod1 rover, which had been lost for almost 40 years. The spacecraft pinpointed the rover's location to within150 feet (45 m), allowing researchers on Earth to bounce laser signals offLunokhod 1's reflector for the first time ever. These signals are providingimportant new information about the position and motion of the moon.